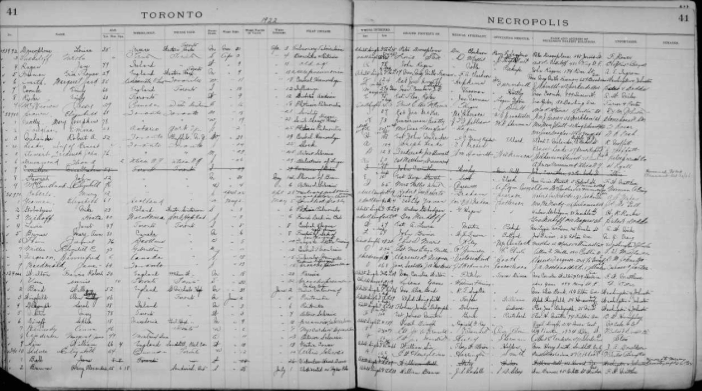 The FamilySearch.org website offers FREE access to their database - ONTARIO, TORONTO TRUST CEMETERIES, 1826-1989. There are 98 people in the database who have listed Greece as their place of birth. The records included were created to provide a list of those buried in the Toronto Trust Cemeteries: Potter’s Field, Toronto Necropolis, Mount Pleasant Cemetery, and Prospect Cemetery. The registers are hand-written on a preprinted form. The names are arranged alphabetically by surname. The first non-sectarian cemetery in the city of Toronto was created following the city council’s 1825 decision to purchase a plot of land for this purpose. This was ratified by Parliament in 1826 and the first public cemetery was named the York General Burying Grounds but became better known as “Potter’s Field.” This site would be sold off in 1855 and the remains moved to the newly purchased Toronto Necropolis. As the city increased in population the trustees of the Toronto General Burying Ground would purchase the Toronto Necropolis from its owners in 1850. With continued increase in population in 1876 the Mount Pleasant Cemetery was added. Finally, in 1890 the Prospect Cemetery was added to serve the city’s growing west end. This collection is a reliable record of individuals buried in the cemeteries, barring human error or deliberate falsification.